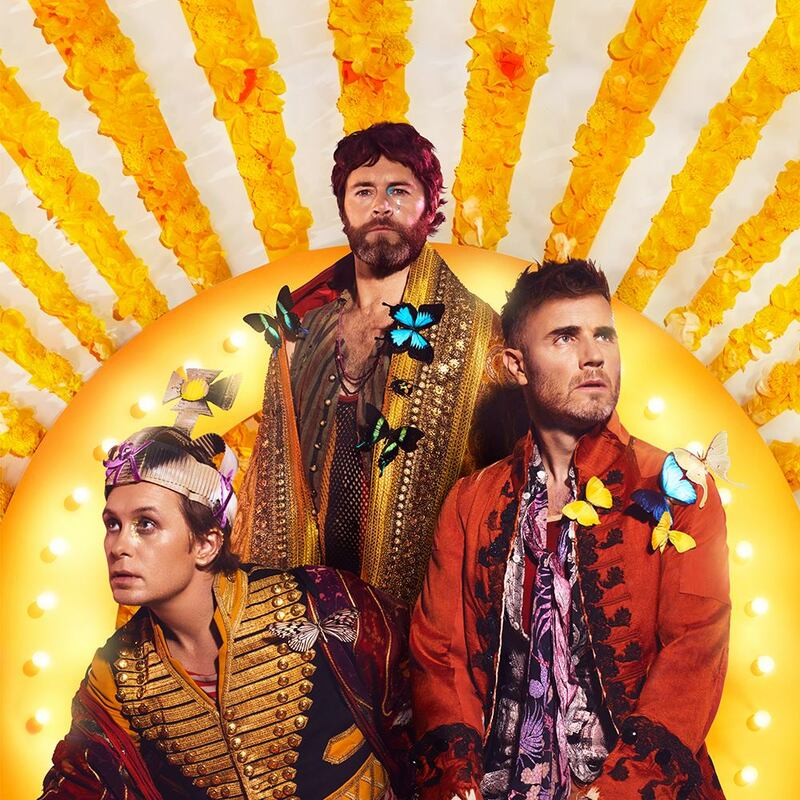 Could British pop band Take That take David to ‘Wonderland’ for his latest album review? He’s a big fan of the boys, so will the new LP tickle his fancy? Let me take you back to 2010. It’s a dreary November evening back in my hometown in Canada and I’ve just received my copy of the Take That documentary ‘Look Back, Don’t Stare’. After becoming spellbound with ‘The Flood’ and their album ‘Progress’, it’s incredible to follow the journey they went on to create the album. There is tension, apprehension and drama throughout, but they all find a way to collaborate and create some studio magic. Elton John appears on screen to say “Do you know how big this song is going to be?” when referencing ‘The Flood’. He couldn’t have predicted it better; the track becoming one of the biggest singles in the UK that year. It set high standards for their future work as the album sat at number one for weeks and the tour that followed was a massive success. Sadly, their time as a permanent five-piece was limited, with Robbie returning to his solo career and Jason deciding he no longer wanted a career in music in 2014. Now arriving at album two as a three-piece band, the question is can they recapture the magic of 2010’s monster of an album in 2017? As a Take That fan, the answer is ‘no’. There’s something missing from the album; I can only describe it as a lack of fairy dust. Lead single ‘Giants’ is an absolutely incredible song and as a standalone track hits the heights of their 2010 work. Soaring vocals, empowering lyrics and lush arrangements mean it’s made to be played in arenas all over the world for fans to go crazy over. But that’s where the quality ends for this album. The boys recently appeared on a special edition of ‘Carpool Karaoke’ with James Corden for Red Nose Day and throughout you heard just how many great songs they have. You also heard how amazing their vocals and harmonies can be. The things that have made Take That songs so enjoyable in the past are not at the forefront of this album and I think the mixing might be somewhat to blame here. There’s a lot of lead vocal and not much else coming through. There are some good album tracks here, but no obvious second single. That’s in part because production feels cheap and fails to meet the standard found on the lead single. Running at 15 songs long on the deluxe edition, it almost feels like the boys have run out of steam and are kind of just throwing the kitchen sink at the project to get it off the ground. Feeling uninspired? Chuck more tracks on the album! Some of the songs just feel super cheesy; ‘New Day’ is one of those. It’s a half-baked concept which fails to fire. A strange beat mixed with quirky vocals from Mark is dated and completely strange. And then the “yeah yeah yeah” backing vocals found in the track ‘And The Band Plays’ are straight out of the ’90s (and not in a good way). Has Gary run out of ideas and is just searching through his back catalogue of songs and picking whatever is leftover from all his songwriting books? The whole thing feels dated. Lyrically Gary and the boys have always had a way to articulate the stories they want to tell in a truthful and insightful way and I feel like they still manage to deliver on this for the most part. The amazing harmonies and vocals though? I keep going back to them because sadly, they are missing. Nearer to the end of this album, a couple of songs attempt to redeem all the problems, but sadly it’s not enough. ‘Up’ and ‘Come On Love’ are excellent and while not likely to be future singles, they are great songs and worth a listen. It’s not often I call something a train wreck but it’s warranted here. Take That fans deserve more than a few good songs and I’m super disappointed in this release. It’s hard to be so disappointed when you’re reminded of how good they are live. Production has really let them down on ‘Wonderland’ and it’s heartbreaking to hear, as I am such a big fan. A bit of a rethink and a repackage later this year might add some closure to this project. Let’s see what happens next. MUST LISTEN : Giants, Up, Come On Love.